Airtel is offering now get up to 5GB FREE Night Data with My Airtel App for all Airtel Prepaid subscribers (Users) in India. 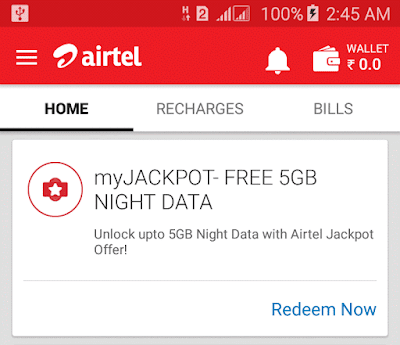 Just complete Airtel JackPot offer 5GB free internet data for 28 days. The free data availed can be used only at from 12 AM to 6 AM (Night). If you use outside these hours then the balance will be deducted from User's regular data pack or main balance. This Offer will be valid till 30 June 2017. So try all Airtel users before expired this offer. How to get this airtel 5gb free internet offer? Just follow below all the steps to get airtel myjackpot offer. At first download My Airtel App from play store. Register and log in to existing account. There will be 11 offers now like, Recharge and Earn, Recharge for Friend, Listen to music, Wynk Music, Download 3 games etc. Now complete all the offers and get 5.1GB Free night internet data. 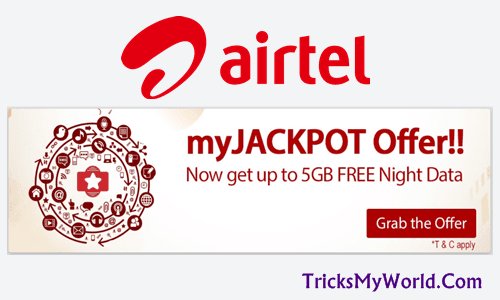 Enjoy Airtel jackpot offer 5gb free internet. First, click on the offer then it will redirect to recharge page, now recharge any amount or any pack (Recommended - Rs.10) to your same registered airtel number in my airtel app and now you will get an instant message that “Congratulations! Enjoy free 1GB night data, valid for 28 days”. That’s it. Click the offer and recharge any amount or pack to your friend mobile number or your another no and get free 500MB data instantly. Click on the offer and share your referral link with your friends on Facebook, Whatsapp etc and get 500MB when your friend installs my Airtel app. Download Sultan: The Game, Ultimate Teen Patti or any other game on the Wynk Games App and get free data. 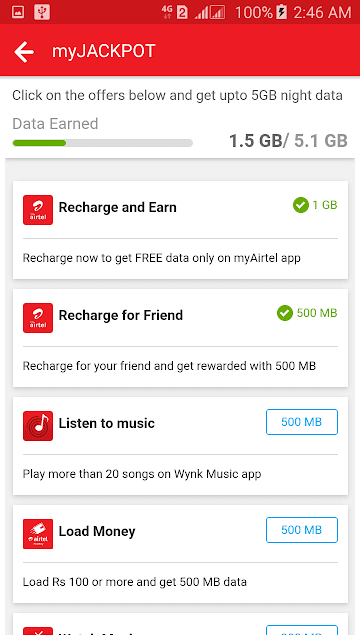 Download any album full songs on Wynk Music App and get 200MB free data. Click on “Download All” to start. For example, go the album and click on Baahubali movie then download (all songs). Play Desi Boyz or any other premium movie on the Eros Now channel on Wynk Movies app. Tricks: Search the movie “Play Desi Boyz” and just watch the movie trailer 2minuts. Now you will receive the data. Play Shahid Kapoor’s Haider or any other movie on the Hooq channel on Wynk Movies app, do the same above trick watch the movie trailer. Download any 3 out of 3000+ premium games available for you on Wynk Games app. Play more than 20 songs on Wynk Music App this month and get the free 500mb data. Load Rs.100 or more amount on Airtel money app and get free data. Send Rs.100 or more amount on Airtel money app and get 500 MB free data. Note: Airtel jackpot offers are changed their every customer, they don't give same offers to all. So carefully read the offer instruction then complete all offers. Offer valid for only Airtel Prepaid Users. The credited night data valid for 28 days. I hope you got the Airtel JackPot offer 5GB free internet Night Data. If you have any problem then comment below and share this trick with your friends on Facebook, Twitter, Google+. Tricks My World mainly focus on tricks and tips related to Mobile, Computer, Software, Free GPRS Tricks, Free Recharge Tricks, Network Tricks and How-To Guides etc.